Grill hamburger patty and onions (optional), then fry an egg. Scoop rice into a bowl or onto a plate. Add hamburger patty and onions, followed by egg. Accompany with macaroni salad for an authentic plate lunch. I love the variations on the loco moco, esp. portuguese sausage! How about with a braised short rib? 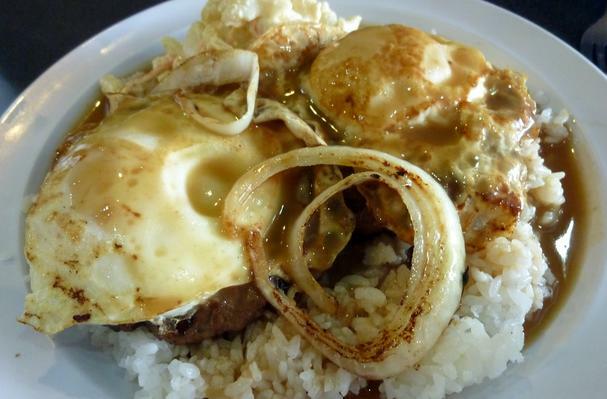 Loco moco is a popular plate lunch meal in Hawaii. The dish is thought to have originated in the city of Hilo on the Big Island, and typically contains rice, a hamburger patty, fried egg, and gravy. There have since been many variations on this local favorite, including spam, portuguese sausage, and kalua pig in place of or in addition to the hamburger. A common accompaniment is mac salad.